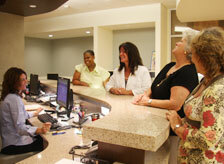 It’s hard to believe that Temple Health Women’s Care has been open for over a year now. For me, the medical director, the year has flown by and much has happened. All of our medical specialties are up and running and all the doctors and staff are working in collaboration. To be honest, this is no small feat for a single year in practice. There’s still a lot to be done, but I feel like I’m settling in to my work here. What’s most exciting and gratifying is the fact that our patients are settling in as well. Our vision of a place where women can come and have many of their health care needs met under one roof, saving time, energy and anxiety, is now coming to life. Many of our patients have been seen for a gynecologic or internal medicine visit, and while here, learn they can also have their mammograms and DEXA scans taken care of, often during the same visit. Some of those same patients may be tapping into our nutrition or counseling or acupuncture services, coming in on a regular basis. Still others are coming for a specialist visit or a procedure, or circling back for follow-ups with primary care. Our patients tell me they’re happy to see the same friendly faces each time they come in, and I know we, the staff and providers, are enjoying getting to know all of these women. Temple Health Women’s Care is becoming a safe haven even for those who fear coming to the doctor. We can’t ask for more than that. Currently, our services include internal medicine/primary care, gynecology, cardiovascular health, plastic surgery, urogynecology, imaging services and acupuncture. Through independent providers, we also offer gastroenterology, nutrition, psychology and urology. As we enter our second year, we are committed to promoting wellness for our patients, empowering our patients to help themselves even more. We’ve heard from some of you that you are interested in weight and stress management, meditation and exercise. We are beginning to look at how we might add some of those services to what we already offer. So look out for future opportunities to join us for wellness activities. I’m excited to move into this new year and can’t wait to see what it will bring! If you would like more information or are interested in scheduling an appointment, please call our office at 215-517-5000. We recently joined Facebook, so please “like” our page and share your thoughts with us. All the best of health to you. We look forward to meeting you and hope you’ll come see us!